A Spiritual Experience and Just Plain Fun! That's what called to us. 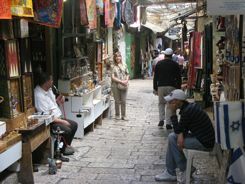 The old city... with pilgrims from three major religions mixing in streets and alleys that can leave you wonderfully lost. I should probably tell you it was a spiritual experience to visit there.... and it was. I should probably tell you that its walls and churches and mosques and synagogues were breathtaking.... and they were. I should probably tell you that the sense of history you felt was awesome... and it was. ...especially Old Jerusalem, was just plain fun.... we had a ball! If you read world headlines, it might seem scary to plan a trip to Israel. Always pay attention to world event and travel advisories. There are ongoing struggles over the Holy Land, but if you pay attention to the news, you'll know that most of the time it is safe... especially for tourists. It was when we were there. Israel and Jerusalem are worth your time and effort. The most historical and holy part of the city is the Old City. 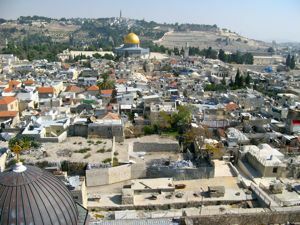 Most major religious sites for the three major religions are within the walls, or just outside on the Mount of Olives. 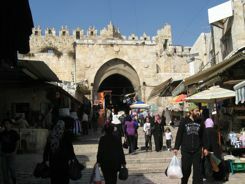 The Old City is a maze of lively alleys and colorful souks or bazaars. ...The friendly citizens will help you find your way. It is divided into four "quarters"... The Armenian Quarter, the Christian Quarter, the Jewish Quarter and the Muslim Quarter. 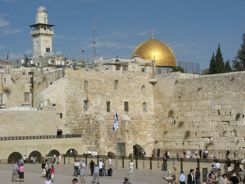 We were really impressed by the fact that within an hour or two you could visit the Western Wall, sacred to the Jews; then walk the ramp up to the Dome of the Rock on the Temple Mount sacred to Muslims; and in short order be on the Via Dolorosa and follow it to the Church of the Holy Sepulchre, sacred to Christians. 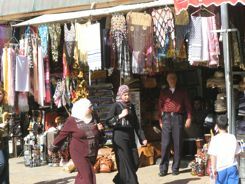 There are lively bazaars to wander and shop in, filled with everyday items for the city's citizens as well as antiquities (real and fake) and souvenirs for tourists. No matter what they're selling today, these souks have been selling to locals and pilgrims for hundreds of years. You often feel like you are walking back in time... and sometimes you feel like you are walking underground as the maze of alleys crisscrosses above and under and around buildings and other alleys. 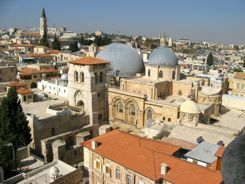 If you want to get above it all, walk the towering walls that surround Old Jerusalem or climb a bell tower in one of the many churches for a birds eye view. 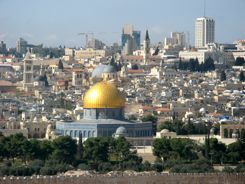 Climb the Mount of Olives to visit religious sites, but also to get a great view back onto Old Jerusalem with the beautiful gold Dome of the Rock gleaming in the foreground. The climb is steep, but worth it. We ordered hummus and shish kebabs... What we got was salad, pita bread, shish kebabs and the best hummus we've ever had.... all for a very reasonable price. We felt safe walking the Old City day and night. There are fewer restaurants open at night. Fewer still to choose from if you want wine or beer. 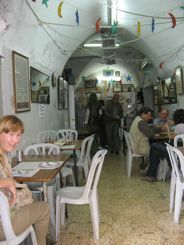 We enjoyed great Armenian meals and Palestinian beer at the Armenian Tavern. 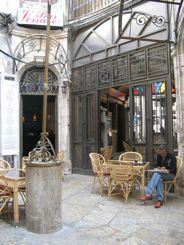 We loved Versavee Bistro, Bar and Cafe near the Jaffa Gate so much that we ate there twice and stopped for a beer just before we left for home. These are family run places, and if you stop by more than once, you are a friend. Most hotels are outside of the Old City. There are great restaurants and shopping outside of the walls as well. There are government buildings and museums to visit and interesting neighborhoods to explore, but we found we wanted to spend all of our time in Old Jerusalem... just for the fun of it.